Habit: Annual 10--40(50) cm. Stem: branches 0--few, occasionally many, throughout; strigose and short-rough-hairy, hairs generally ascending, occasionally spreading. Leaf: 0.5--5 cm, linear to oblong below, +- lanceolate above, generally strigose to short rough-hairy, hairs occasionally spreading on margins, generally bulbous-based. Inflorescence: in (1s) 2s or 3s; bracts generally 0; pedicel 0.5 mm, occasionally elongated in fruit to 1(1.5) mm, spreading to occasionally ascending. Flower: calyx +- constricted above, deciduous, lobes lanceolate, generally +- ovate in fruit, margins sparse- to dense-strigose or ascending-rough-hairy, +- brown, midvein +- thickened with 0--few spreading bristles; corolla deciduous, appendages minute or 0. Fruit: nutlets (3)4, 2--2.5 mm, lanceolate to lance-oblong, gray, +- brown, or mottled gray and brown, generally papillate to white-tubercled, dull to shiny, base truncate, tip +- elongate; abaxially low-rounded, spine 0; adaxially biconvex, occasionally smooth, attachment scar edges not raised, abutted toward tip, +- gapped lower 1/2 or abutted entire length, +- triangular-gapped at base; axis generally to nutlet tips. Habit: Plant generally slender, green, basal rosette generally not well developed. 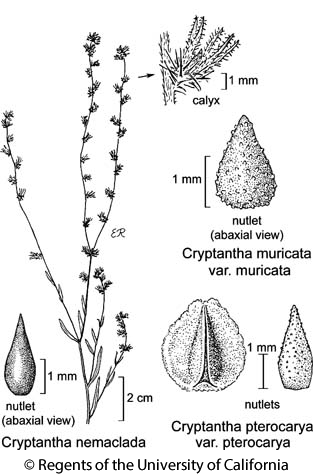 Flower: calyx 2--3 mm, 3--4(6) mm in fruit, deciduous; lobes dense-strigose; corolla limb 1--2 mm diam, appendages 0 to minute, pale yellow to white. Fruit: nutlets dissimilar, 1 persistent, margin narrow, rounded, not a wing, (2)3 deciduous, margin a +- flat lobed wing > 0.5 mm wide, gray or mottled gray and brown, grainy to white-tubercled, shiny. Citation for this treatment: Ronald B. Kelley, Michael G. Simpson & Kristen E. Hasenstab-Lehman 2012, Cryptantha pterocarya var. pterocarya, in Jepson Flora Project (eds.) Jepson eFlora, http://ucjeps.berkeley.edu/eflora/eflora_display.php?tid=57154, accessed on April 24, 2019.
s SN, Teh, w SnJV, n TR, e PR, GB, D; Markers link to CCH specimen records. Yellow markers indicate records that may provide evidence for eFlora range revision or may have georeferencing or identification issues. Purple markers indicate specimens collected from a garden, greenhouse, or other non-wild location.